When we initially detailed Felt’s 2015 lineup in August, we were eager to share how Felt was bringing high-end tech to the masses. The IA will be available in four build options, including a mechanical Ultegra build with a price point at the bottom of the superbike pile. And the B2 has been resurrected with Ultegra Di2 at an unbelievable price point. 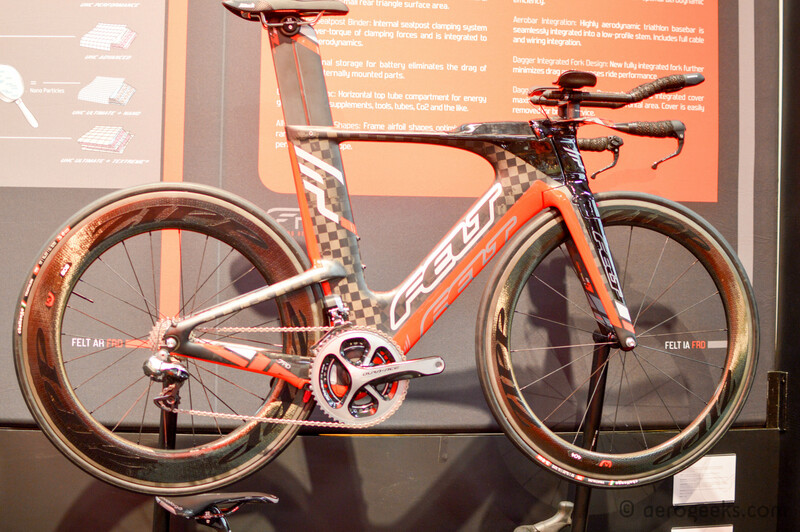 We were excited to have a peek at these builds at Interbike, as well as a few of Felt’s championship winning bikes on display for us show goers to drool over. See what we mean in the galleries below. The 2015 IA will be available with Dura-Ace Di2, SRAM Red 22, or Ultegra 6800 (mechanical). The DA builds are available in either Felt’s top-of-the-line UHC Ultimate + TeXtreme carbon with a Zipp 404/808 wheelset (IA FRD – $13,999). For those looking to save a few dollars but keep DA Di2, the IA2 swaps out the Zipps for a Novatec 50mm/90mm combination and uses UHC Advanced carbon fiber. More exciting are the IA3 and IA4 builds offering Red22 and Ultegra, respectively. For $6,999 the IA3 combines Red22 (with R2C shifters) with Novatec wheels (50mm front and back). The IA4 is the cheapest way (at $5,499) to get into an IA frame and comes with Ultegra 6800 paired with 35mm Felt TTR3 wheels. Not exactly cheap but still very well priced when compared to other superbike options. 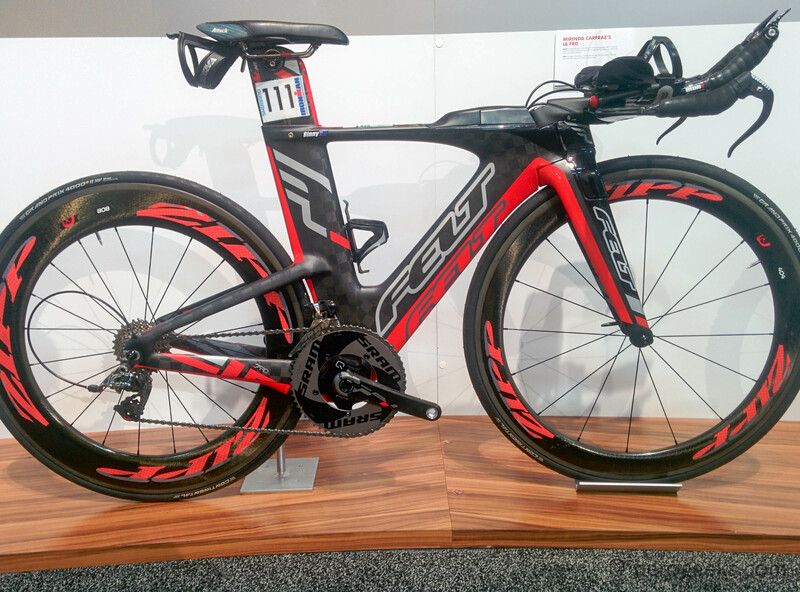 Felt is only offering the DA in a single build for 2015 – the DA1. For $4,999 you get a DA frame built from UHC Ultimate + TeXtreme carbon fiber paired with a Dura-Ace mechanical drivetrain. The big change is a new fork which includes integrated brakes. The B2 was the bike we were most excited to see on display. For triathletes, an electronic drivetrain does offer an advantage over a mechanical when you can shift out of the pursuits. The B2 comes packing Ultegra Di2 on a DA frame (without the integrated front end). The only downside is that the B2 does not include the Di2 brake lever shifters, but considering the price is just $3,699 and you can get a set of Di2 brake lever shifters for a little over $300, we still consider the overall package to be a great deal. Felt also brought Rinny’s Kona winning IA and Sarah Hammer’s TK1 track bike out to Vegas. And while these machines have some of the best components money can buy, they still look like any other bike you would find racked in transition – including a cage Zip Tied to the saddle. Though the Kona sticker may be not be all that common!